Women have little educational opportunity in most parts of the world - except Christian countries where women usually do as well or even better than men. Buddhist women get better educated - 7.4 years compared to 8.5 years for Buddhist men. However, Christian women across the world have almost the same educational achievement as men: 9.1 years of formal education compared to 9.5 for men. Those educational levels were surprisingly low to me. However, there are hundreds of millions of Christians in sub-Sahara Africa and the Asia-Pacific where educational levels are lower for all people. Some 2.2 billion of the world's people are Christian - far more than any other faith. Yet, on average they enjoyed 3.7 more years of education than either Muslims or Hindus. Why? Credit must be given to Christian missionaries who left the comfort of their homes in Western countries - and reached out to share their faith and commitment to education across Africa and Asia. However, the world's Jews have by far the highest education levels - an average of 13.4 years. Thus, the average Jew has had some college education. And the achievement level of Jewish women is equal to that of the men - 13.4 years. What is of particular concern is that hundreds of millions of the world's people have never attended school. About one in five adults globally - but twice as many Muslims and Hindus - have had no education at all. Four in ten Hindus (41%) have not been schooled nor have a third of Muslims. The good news is that more are getting educated. While only 43% of Hindus aged 55-74 have had some formal schooling, the figure rises to 71% among youngest adults, aged 25-34. The situation is similar among Muslims. Only 46% of the oldest Muslims had some education, but 72% of the youngest adults have attended school. Yet nearly three in 10 of even young Muslims and Hindus are not being educated. According to the Census, only 11.6% of Americans aged 25 or older have not earned a high school degree. Some 29% have a high school diploma and another quarter have attended college - nearly half of whom have earned an AA degree. Another 43.5 million American have earned a college degree, which is a fifth of the population. What's most remarkable, another 25 million Americans have earned a Masters or higher level of degree. That's 12% of Americans, more than those who don't have a high school diploma! What about American women compared to the men? Many slightly exceed the educational achievements of men! Some 26% of women have some college education or an AA degree vs. 25.3% of men. And 20.6% of American women have a college degree - slightly more than the 20.3% of men. What about advanced degrees? The genders are tied, with 12% of both men and women earning a Masters, a Doctorate or a professional degree. 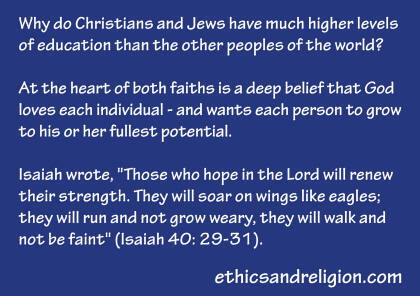 Why do Christians and Jews have much higher levels of education than the other peoples of the world? At the heart of both faiths is a deep belief that God loves each individual - and wants each person to grow to his or her fullest potential. Isaiah wrote, "Those who hope in the Lord will renew their strength. They will soar on wings like eagles; they will run and not grow weary, they will walk and not be faint" (Isaiah 40: 29-31). Paul also states, "There is neither Greek nor Jew, slave nor free, male nor female, for you are all one in Christ Jesus" (Galatians 3:28). Thus, Christianity teaches that women are as important as men - and they believe it! than cultures of other faiths.